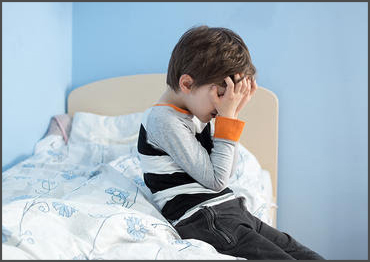 What symptoms may be associated with bedwetting? •	Wetting during the day. •	Frequency, urgency, or burning on urination. •	Straining, dribbling, or other unusual symptoms with urination. •	Cloudy or pinkish urine, or blood stains on underpants or pajamas. Which medication may be used for the treatment of nocturnal enuresis in children? PHARMACOLOGIC TREATMENT. Desmopressin (DDAVP) and imipramine (Tofranil) are the primary drugs used in the treatment of nocturnal enuresis. Pharmacologic treatment is not recommended for children under six years of age. It affects 5 to 7 million children in the United States. Primary nocturnal enuresis is caused by a disparity between bladder capacity and nocturnal urine production and failure of the child to awaken in response to a full bladder. Less commonly,enuresis is secondary to a medical, psychological, or behavioral problem. Estimates suggest that 7% of boys and 3% of girls age 5 have enuresis. These numbers drop to 3% of boys and 2% of girls by age 10. Most children outgrow this problem by the time they become teens, with only about 1% of males and less than 1% of females having the disorder at age 18. The Bedwetting Gene, "The majority of bedwetting is inherited," says Bennett. "For three out of four kids, either a parent or a first-degree relative also wet the bed in childhood." Scientists have even located some of the specific genes that lead to delayed nighttime bladder control. What medication is used for bedwetting? There's no medication that cures enuresis — they only treat symptoms. When the drug is stopped, the enuresis will usually return unless the child has naturally outgrown it. Two commonly used drugs are Tofranil (imipramine) and DDAVP(desmopressin acetate).